You Have Been Watching…16 Years of Alcohol | Scots Whay Hae! After my recent post on Laura Fraser (see Tell Laura I Like Her…) I think it only right that we look at one of the films that backs up my claim that she is an overlooked and underrated talent. One of her best, and most archetypal, performances can be found in 16 Years of Alcohol. Written and directed by Richard Jobson, it is an intensely personal film based on his memoirs of the same name. You sense that Jobson threw heart and soul not only into the script, but the movie as a whole. I’ve always been a fan of Jobson. From his musical beginnings in The Skids and The Armoury Show I’ve followed his career closely. I even bought his solo stuff (I still own a vinyl copy of Badman, which even Jobbers would admit was not great). He obviously wanted to be successful, but on his terms. Jobson is a real renaissance man, one who has written and performed poetry, modelled in style magazines such as The Face and Arena and presented various TV art programmes. He may not have been the greatest musician, but he has always had a sense of style and ambition that is rare to find, one that was perhaps always leading him to the world of film. In the way that he controlled every aspect of his life Jobson was an auteur before he ever got near a camera. 16 Years of Alcohol was his debut feature and although he has made interesting films since, it is still his best. The cast is full of well kent faces. 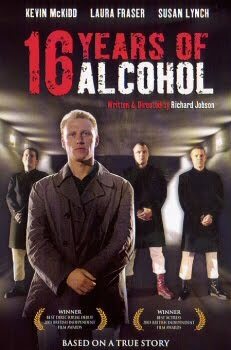 Kevin McKidd plays the lead role of Frankie Mac, the appointed leader of a gang of skins whose interests are music, clothes and violence in any changing order of importance dependent on his mood and his alcohol intake. Laura Fraser’s Helen is the first character to come into his adult life that offers hope of a better future and although the story is never simple the relationship between Helen and Frankie is where the healing begins. There are great performances from some of the best character actors around such as Ewan Bremner, Stuart Sinclair Blyth, Jim Carter and the always enchanting Susan Lynch. Bremner, who too often is asked to play comical ‘Spud-u-like’ roles, here plays it straight and when he does so he is one of the most dependable actors that we have. 16 Years of Alcohol is incredibly stylish, assured and perhaps surprisingly restrained. There are a few moments when Jobson overdoes the visual whimsy, but these add to the individualistic tone and separates it from most other ‘gritty’ Scottish films. He has a style that sometimes strays into the realms of magical realism, and I find this refreshing in terms of Scottish cinema. In this sense the director that Jobson is closest to is Lynne Ramsay. The music and settings are just right, and he doesn’t overdo the sentimentality. This feels like a life lived, and that is not just down to Jobson’s script but McKidd’s performance and the characters that surround him. Some people may feel that it relies heavily on the cliché that all a man needs is the love of a good woman, but that is to misunderstand the film and its message. In the end Frankie has to try and save himself rather than looking to others for salvation. I said in my round up of Scottish Films of the 00’s (see Top Ten Scottish Films of the 00’s…) that this was my favourite of that decade. Watching it again I think it is even better than I first believed. On a second viewing you can look past the flashier aspects and concentrate on the often raw performances. Jobson has the talent and vision to be one of Scotland’s great filmmakers, but so far has been limited to just four feature films. Of those both The Purifiers and New Town Killers are comic book fun, but the most surprising is A Woman in Winter which reminds me of Darren Aronofsky’s The Fountain in places. I’ll be discussing A Woman in Winter in the future. It’s not easy to find so if you can track down a copy, snap it up. It shows the visual flourishes that appear in all Jobson’s films when at their most ambitious. Consideration of Jobson’s back catalogue makes me wonder why we don’t see more from a man who doesn’t strike me as someone who is inclined to rest on his laurels. My guess is that his refusal to compromise will mean that his promise may remain unfulfilled; admirable perhaps, but a shame nonetheless. I hope I’m mistaken.